Podcast listenership has nearly tripled in the last 10 years, and there are no signs of slowing down. People of all walks of life are producing podcasts in 2019: entrepreneurs, educators, artists, and big brands. It’s never been easier for content creators to get their message to their audience. The average podcast listener tunes in to 7 shows per week. Listeners now have more programming options and more listening options. More listening options for your audience means more ways to find your podcast. 49% of podcast listening is done at home, and 22% in the car. People are listening to podcasts while on the treadmill, walking the dog, or commuting to work. Unlike photos and videos, podcasts give people the ability to consume content while doing something else at the same time. For podcasters, knowing which platforms listeners prefer is critical in reaching your audience. 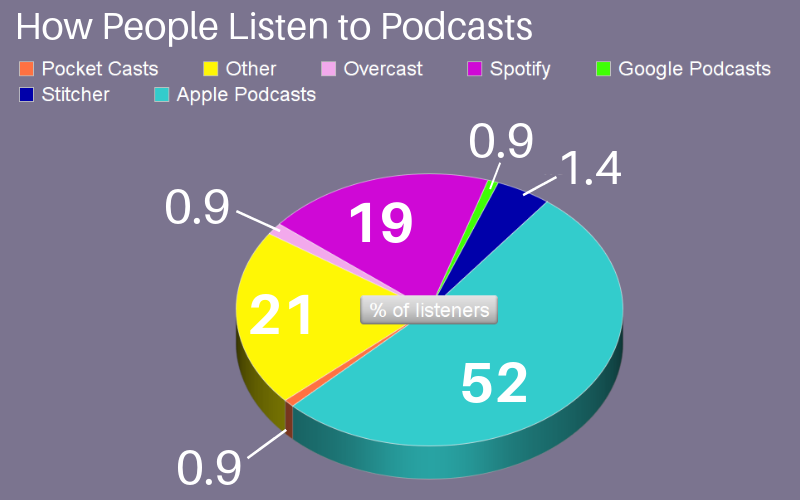 Apple vs Android is a major determining factor for which podcast players listeners will use. iOS (Apple’s operating system) has About 43% of American smartphone market, while Android (Google’s operating system) owns about 54% of that market. Apple has been on the edge of the podcast wave since the beginning, and their position remains solidified at #1, according to this data from Medium. Spotify gained popularity in recent years as a music streaming app, but since adding podcasts to the player, it has taken market share from a number of other apps. In previous years, Google relied on third-party developers to deliver podcast players through their Google Play store. This is why the market looks so splintered between Overcast, Pocketcast, and the various “Others.” In 2018 it created its own podcast player called Google Podcasts. While only a small sliver of listeners currently use this app, it has a large potential for growth since the Android user base is so large.